The man behind ProBlogger.net has just launched another informative blog. Darren Rowse created TwiTip earlier this week, which is a blog dedicated completely to telling you how to get the most out of Twitter. TwiTip is about capturing some of the lessons that I’ve been learning about Twitter and how to use it more effectively. It will cover Twitter Tips of all varieties including Writing for Twitter, Branding, Growing a Following, Corporate Tweeting and a lot more. Darren stated on his other blog that he won’t be posting daily on TwiTip (at least not at the beginning). Of course with a strong brand already in play at ProBlogger.net, getting the word out about TwiTip has been fairly easy for the Australian blogger. On day 1, he reported 1,600 unique hits, mostly from Tweets and other blogs linking to the new site. 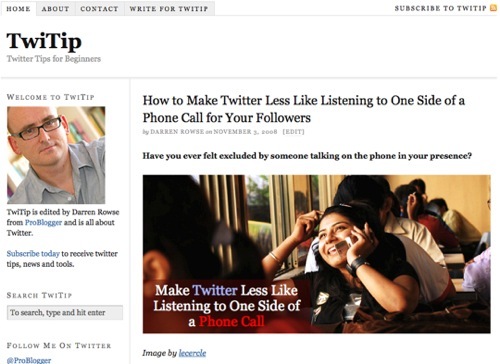 If you’ve been trying to find new ways to leverage Twitter to your advantage, TwiTip just may be your answer. This is one new blog I’ll definitely be watching and reading. The MarketLeverage team loves twitter (and Problogger), so we’ll be frequent visitors to Darren’s new site. Thanks for the tip!